Can LG best the new OnePlus? One of the LG G7 ThinQ’s biggest competitors will be the OnePlus 6, which is set to debut on May 16. Though there’s still a bit of mystery shrouding OnePlus’ latest creation, there’s still plenty to talk about when it comes to comparing it to LG’s new, notch-touting smartphone. First off, LG’s option is almost guaranteed to be more expensive, but can it outperform the latest OnePlus? We’ll go through several categories to suss out their differences to see which one climbs ahead. Plus, we’ll be updating this article as we learn more about the OnePlus 6. Interested in seeing how the G7 ThinQ stacks up to some other competition? Check out the links below. While OnePlus has always stuck with aluminum for its chassis material, it has recently confirmed to be going with glass for the OnePlus 6. This puts it at neck and neck with the LG G7 ThinQ’s design, which yields support for wireless charging. Both the G7 ThinQ and OnePlus 6 share a lot in common when it comes to design and hardware features, but each has one feature that sets them apart from the other. You’ll find a headphone jack and USB-C charging port on their bottoms and a power button mounted on the right side. The volume rocker is located on left, but OnePlus 6 will keep its famous alert slider to quickly adjust volume profiles. The G7 ThinQ may not have that, but what it does have is a Google Assistant button that will bring up the voice assistant with a press. From a design perspective, these waterproof phones look quite similar head-on thanks to their notches. In fact, you might have a hard time distinguishing them if not for their unique software launchers. The LG G7 ThinQ will stow a 6.1-inch LCD display that runs at a Quad HD Plus resolution. Basically, the plus comes from the extra bit of real estate gained by utilizing screen space around the notch, putting the phone at a 19.5:9 aspect ratio. The new OnePlus phone is likely to have a similar amount of screen space, too, given that it will also feature the notch. What remains to be seen is whether OnePlus will adopt LCD or OLED for its phone. Additionally, OnePlus tends to stick with Full HD resolution, a boon to battery life, though the OnePlus 6 could very well be its first Quad HD smartphone. The LG G7 ThinQ will feature Android Oreo out of the box and we can likely say the same for the OnePlus 6. It's always difficult to predict if and when each will see their Android P updates once the software releases later in 2018, but hopefully sooner than later. Under the glass, both phones will be similar in some ways. You'll find the Snapdragon 845 powering the G7 ThinQ and OnePlus 6, however at least in the US, the RAM count will make choosing between the two rather easy for some. Simply put, is the G7 ThinQ's 4GB not enough? Then OnePlus' 8GB will suit you fine. Of course, the gap narrows in other regions with the G7 ThinQ shipping with 6GB of RAM. All said, both phones will be plenty capable against the onslaught of demanding apps and games set to release in 2018 and beyond. Despite the importance of a solid chipset and RAM, the battery and camera can make or break a phone's appeal. And this is one area in particular where we don't know much about the OnePlus 6. Shifting focus back to LG's new phone, we're looking at its dual-lens camera system on the back of the device. It's now flipped vertically instead of the horizontal array we saw in the LG G6 and LG V30. But beyond that change, LG has opted for two 16MP sensors, the main having an aperture value of f/1.6 and the wide-angle lens rocking a still-respectable f/1.9 aperture for low-light capabilities. On its other side, LG has bumped up the selfie camera to 8MP, so this should elevate it far beyond what we've seen in previous efforts, which frankly, hasn't been great. Moving onto the battery, LG's new phone has a relatively meager 3,000mAh battery, which should give us all-day performance with the option of wireless charging thanks to its glass back. We won't know for sure how long it can last, though, until the final review hits. We expect OnePlus to be competitive in both the camera and battery space, but we don't yet know how it plans to distinguish itself in the OnePlus 6. Price is one section where OnePlus should have it in the bag, even if the OnePlus 6 costs more than any of the company's devices before. 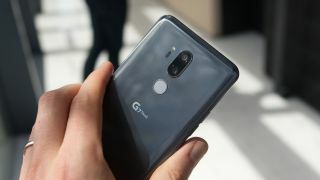 LG is likely targeting the $750-850 price range for the G7 ThinQ, as it has done for its previous phones. How long the new phone will stay at that launch price remains to be seen, but OnePlus will likely undercut it out of the gate by at least $100, which could make it an easy choice for those who want more phone specs for less. There's a very good chance that the OnePlus 6 could end up being the better phone out of the two. We obviously are reserving judgment because the OnePlus 6 isn't in the public eye just yet. But from a value perspective, OnePlus' forte, LG's G7 ThinQ really doesn't seem to offer enough for its price when you compare it to the powerhouse that the OnePlus 6 is likely to be. Of course, this is riding hard on the OnePlus 6 continuing to be an affordable alternative to sub-$1,000 flagship smartphones.